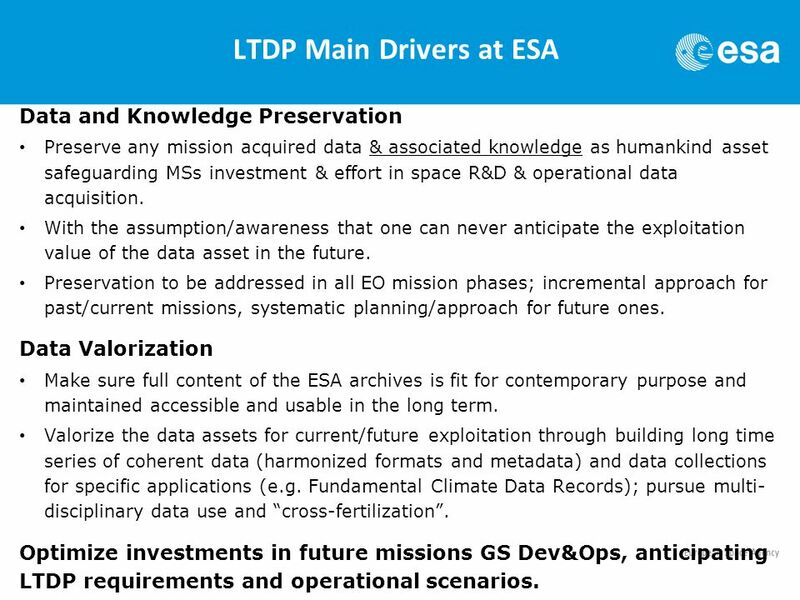 3 LTDP Main Drivers at ESA Data and Knowledge Preservation Preserve any mission acquired data & associated knowledge as humankind asset safeguarding MSs investment & effort in space R&D & operational data acquisition. With the assumption/awareness that one can never anticipate the exploitation value of the data asset in the future. Preservation to be addressed in all EO mission phases; incremental approach for past/current missions, systematic planning/approach for future ones. Data Valorization Make sure full content of the ESA archives is fit for contemporary purpose and maintained accessible and usable in the long term. 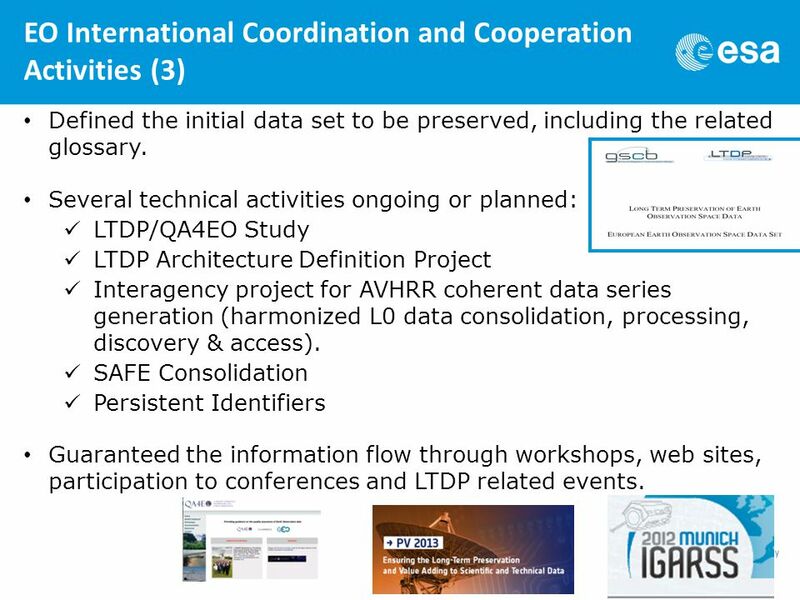 Valorize the data assets for current/future exploitation through building long time series of coherent data (harmonized formats and metadata) and data collections for specific applications (e.g. Fundamental Climate Data Records); pursue multi- disciplinary data use and “cross-fertilization”. Optimize investments in future missions GS Dev&Ops, anticipating LTDP requirements and operational scenarios. 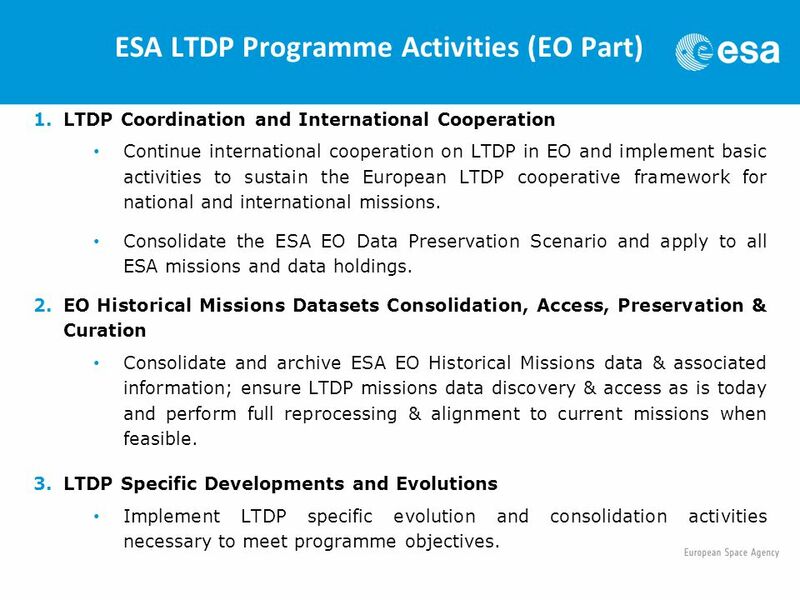 4 ESA LTDP Programme Activities (EO Part) 1.LTDP Coordination and International Cooperation Continue international cooperation on LTDP in EO and implement basic activities to sustain the European LTDP cooperative framework for national and international missions. 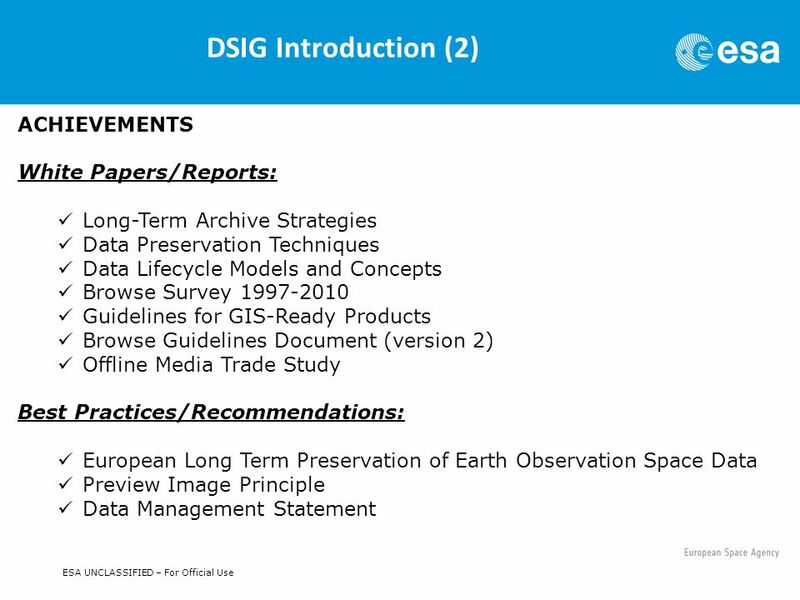 Consolidate the ESA EO Data Preservation Scenario and apply to all ESA missions and data holdings. 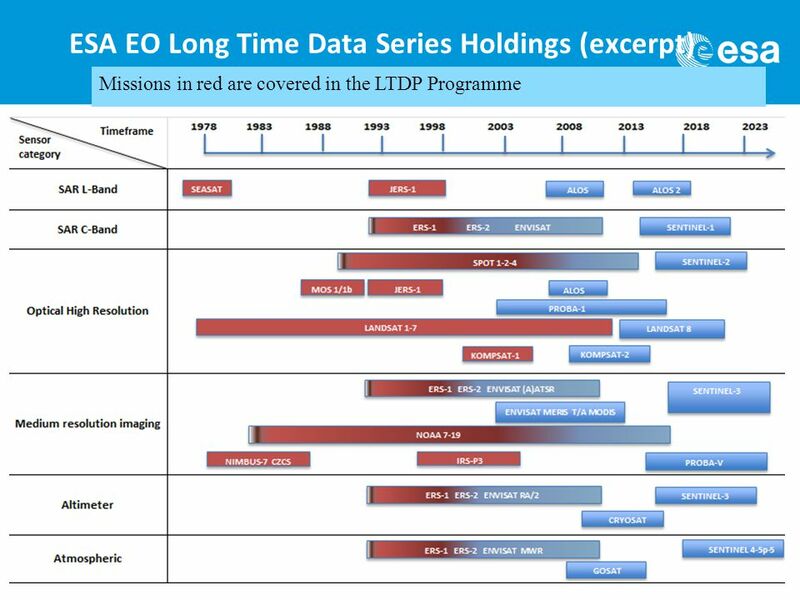 2.EO Historical Missions Datasets Consolidation, Access, Preservation & Curation Consolidate and archive ESA EO Historical Missions data & associated information; ensure LTDP missions data discovery & access as is today and perform full reprocessing & alignment to current missions when feasible. 3.LTDP Specific Developments and Evolutions Implement LTDP specific evolution and consolidation activities necessary to meet programme objectives. 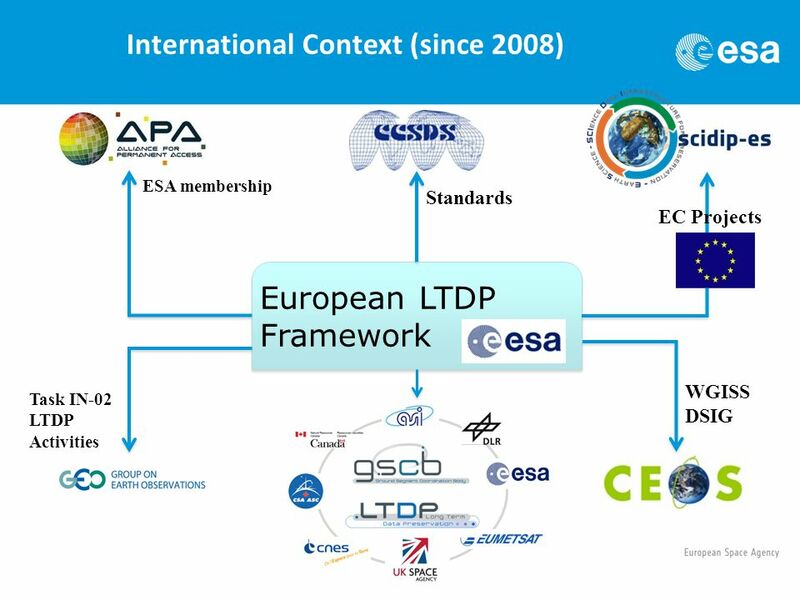 6 EO International Coordination and Cooperation Activities (1) ESA is coordinating the LTDP cooperation activities in the Earth Observation domain with European partners through the LTDP WG formed within the Ground Segment Coordination Body (GSCB). 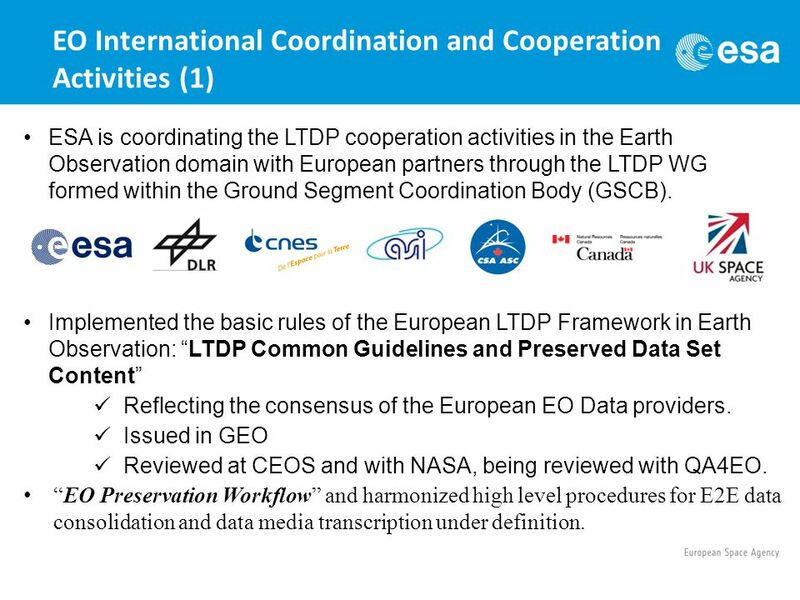 Implemented the basic rules of the European LTDP Framework in Earth Observation: “LTDP Common Guidelines and Preserved Data Set Content” Reflecting the consensus of the European EO Data providers. Issued in GEO Reviewed at CEOS and with NASA, being reviewed with QA4EO. “EO Preservation Workflow” and harmonized high level procedures for E2E data consolidation and data media transcription under definition. 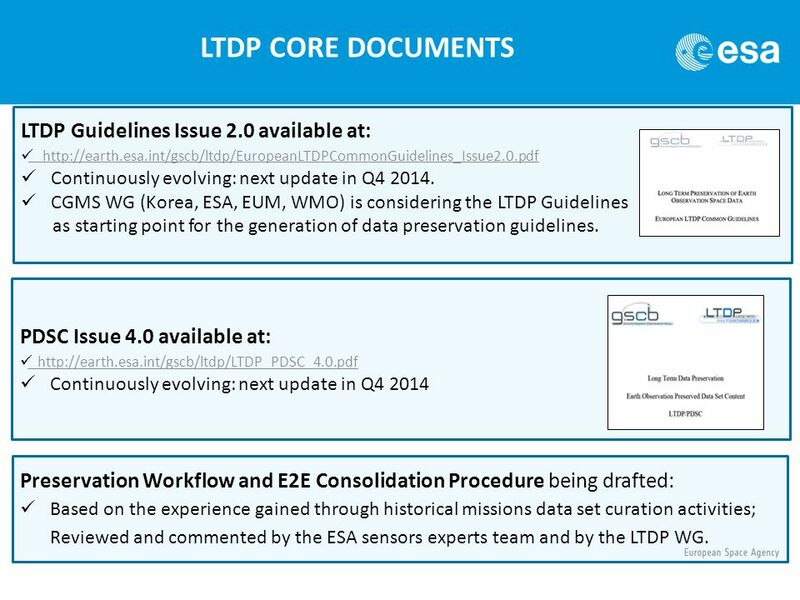 7 LTDP CORE DOCUMENTS LTDP Guidelines Issue 2.0 available at: http://earth.esa.int/gscb/ltdp/EuropeanLTDPCommonGuidelines_Issue2.0.pdf Continuously evolving: next update in Q4 2014. 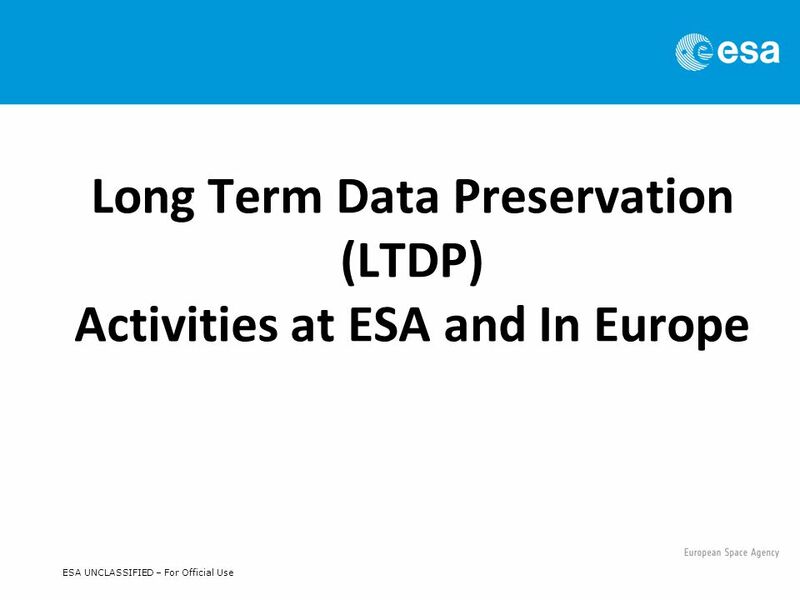 CGMS WG (Korea, ESA, EUM, WMO) is considering the LTDP Guidelines as starting point for the generation of data preservation guidelines. 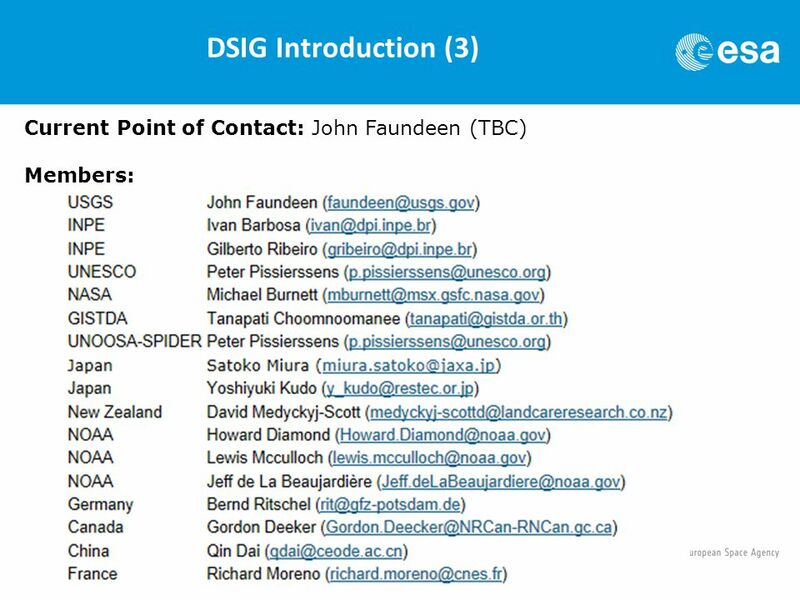 PDSC Issue 4.0 available at: http://earth.esa.int/gscb/ltdp/LTDP_PDSC_4.0.pdf Continuously evolving: next update in Q4 2014 Preservation Workflow and E2E Consolidation Procedure being drafted: Based on the experience gained through historical missions data set curation activities; Reviewed and commented by the ESA sensors experts team and by the LTDP WG. 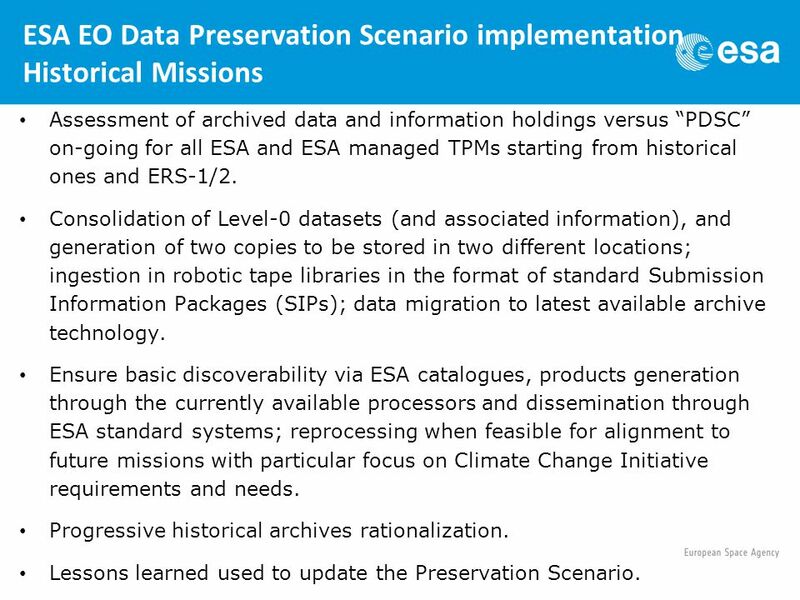 11 ESA EO Data Preservation Scenario implementation Historical Missions Assessment of archived data and information holdings versus “PDSC” on-going for all ESA and ESA managed TPMs starting from historical ones and ERS-1/2. 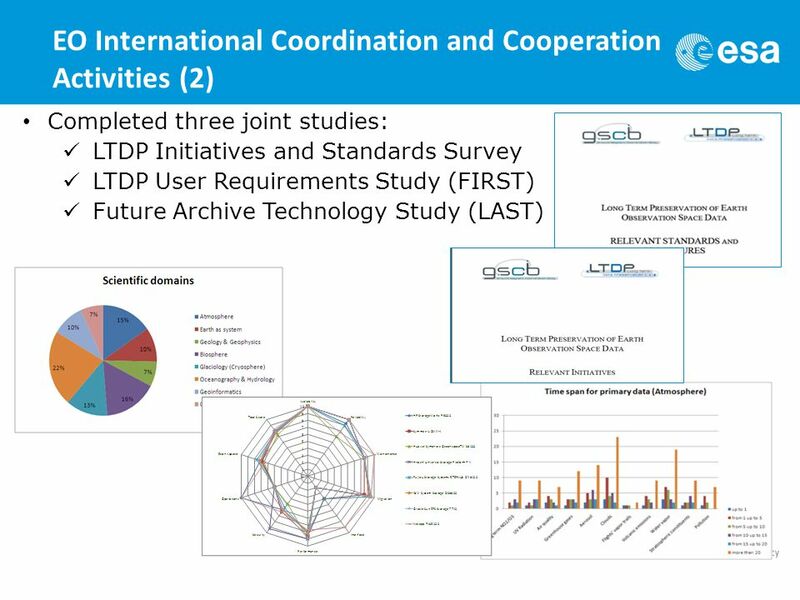 Consolidation of Level-0 datasets (and associated information), and generation of two copies to be stored in two different locations; ingestion in robotic tape libraries in the format of standard Submission Information Packages (SIPs); data migration to latest available archive technology. 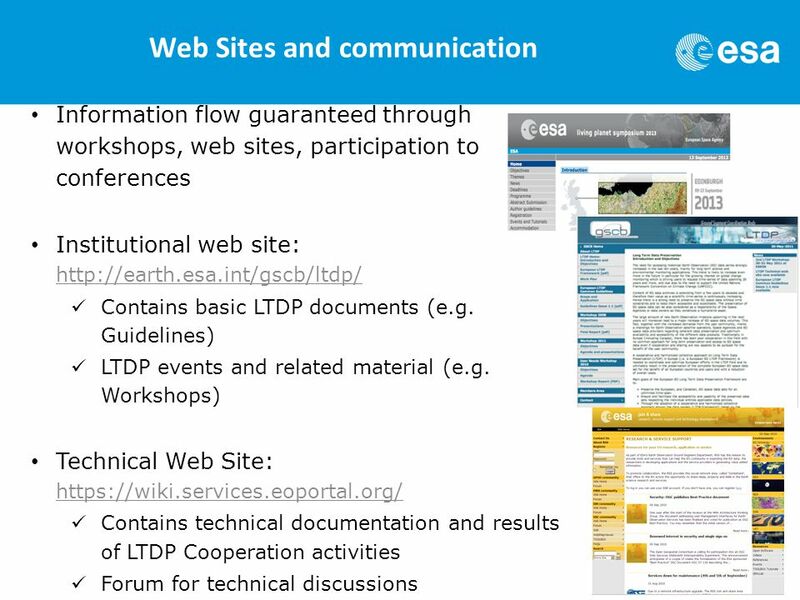 Ensure basic discoverability via ESA catalogues, products generation through the currently available processors and dissemination through ESA standard systems; reprocessing when feasible for alignment to future missions with particular focus on Climate Change Initiative requirements and needs. Progressive historical archives rationalization. Lessons learned used to update the Preservation Scenario. 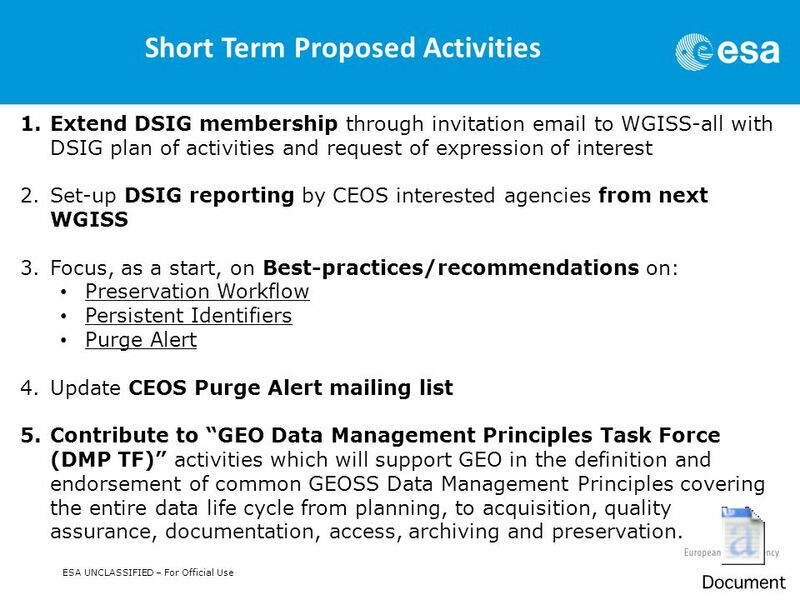 18 ESA UNCLASSIFIED – For Official Use Short Term Proposed Activities 1.Extend DSIG membership through invitation email to WGISS-all with DSIG plan of activities and request of expression of interest 2.Set-up DSIG reporting by CEOS interested agencies from next WGISS 3.Focus, as a start, on Best-practices/recommendations on: Preservation Workflow Persistent Identifiers Purge Alert 4.Update CEOS Purge Alert mailing list 5.Contribute to “GEO Data Management Principles Task Force (DMP TF)” activities which will support GEO in the definition and endorsement of common GEOSS Data Management Principles covering the entire data life cycle from planning, to acquisition, quality assurance, documentation, access, archiving and preservation. 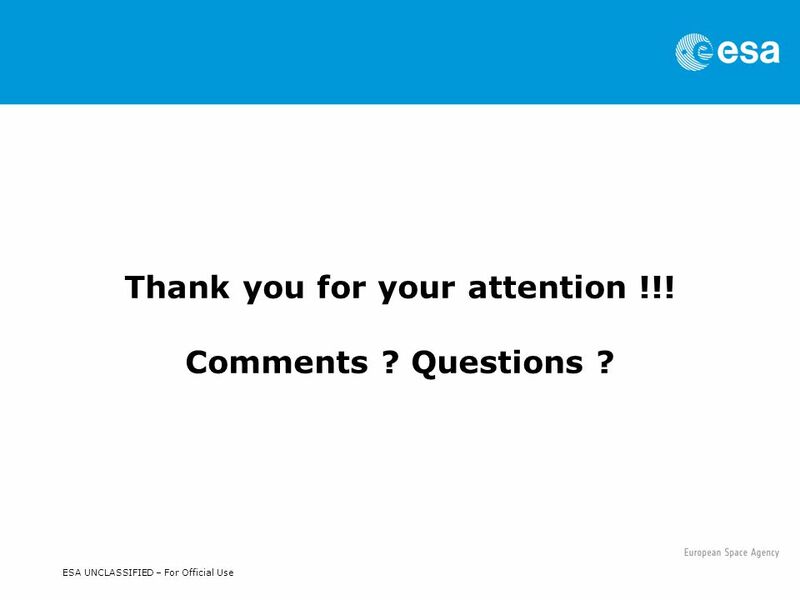 19 ESA UNCLASSIFIED – For Official Use Thank you for your attention !!! Comments ? Questions ? 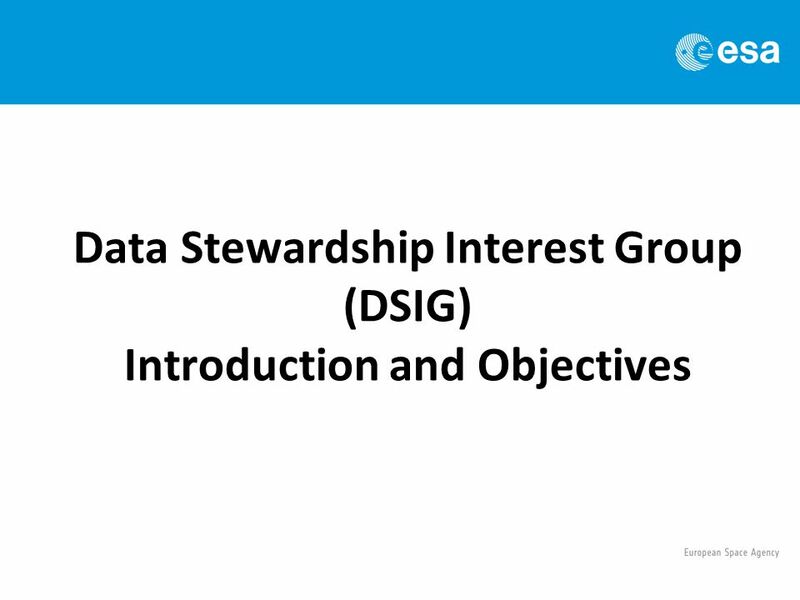 Download ppt "ESA UNCLASSIFIED – For Official Use Data Stewardship Interest Group Session LTDP Activities & DSIG Introduction WGISS-37 Meeting Cocoa Beach (Florida-US)"
1 The ESA SCIENTIFIC TESTBED in CASPAR S. ALBANI (ESA) CASPAR Workshop, Rome, september 2009. U.S. Department of the Interior U.S. Geological Survey Data Services Task Team Proposal Discussion at WGISS #25 February, 2008 Lyndon R. Oleson U.S. Geological. Space/GMES and Climate Change Mikko Strahlendorff, GMES Bureau. 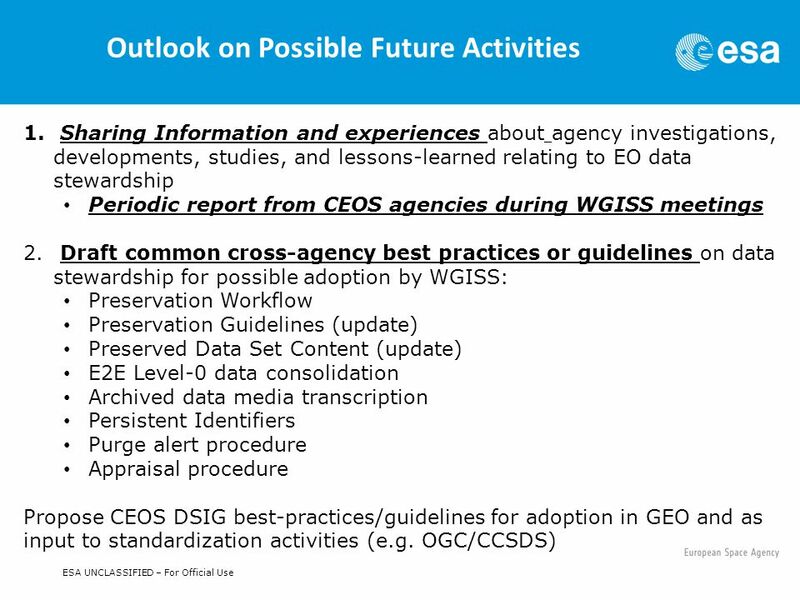 CEOS-led response to the GCOS-IP Mitchell D. Goldberg CEOS Climate SBA Coordinator NOAA/NESDIS 1. Wrap-up Ground Segment Coordination Body Workshop 2012 ESA/ESRIN, Frascati, 6-7 June 2012. The CEOS Constellations Status and Way Forward SIT September 2006. CEOS WGISS Technology & Services Subgroup Overview by Wyn Cudlip British National Space Centre/QinetiQ Presentation. Slide: 1 27 th CEOS Plenary |Montréal | November 2013 Agenda Item: 15 Chu ISHIDA(JAXA) on behalf of Rick Lawford, GEO Water CoP leader GEO Water. 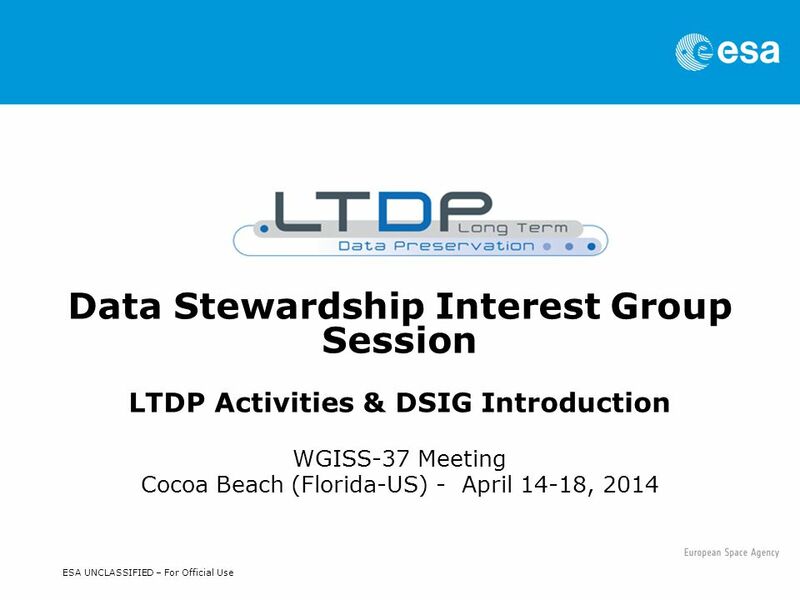 PV2013 Summary Results Data Stewardship Interest Group WGISS-37 Meeting Cocoa Beach (Florida-US) - April 14-18, 2014. NOAA Metadata Update Ted Habermann. NOAA EDMC Documentation Directive This Procedural Directive establishes 1) a metadata content standard (International. WGClimate Work Plan for John Bates, Chair WGClimate 4th Working Group on Climate Meeting. WGISS CNES SIT-30 Agenda Item 10 CEOS Action / Work Plan Reference 30 th CEOS SIT Meeting CNES Headquarters, Paris, France 31 st March – 1 st April 2015. SIT-27 Meeting La Jolla, CA, USA March 26-28, CEOS participation in GEOGLAM Timothy Stryker CEOS Executive Officer Yves Crevier Canadian Space Agency. 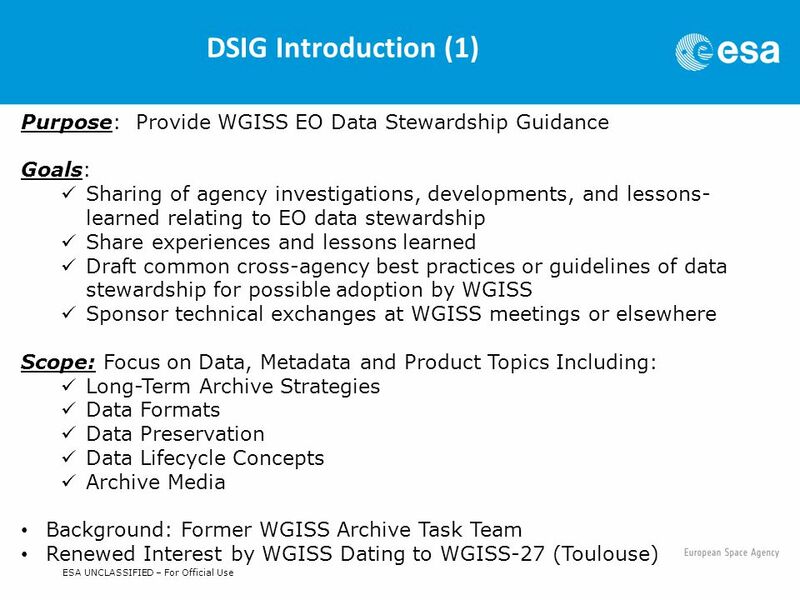 GEO Data Management Principles Implementation : World Data System–Data Seal of Approval (WDS-DSA) Core Certification of Digital Repositories Dr Mustapha.